This essay takes goes places that I hadn’t figured on going before I sat down to write it, but covers a subject that was perhaps overdue, so here goes. The Photonic Energy Center (PEC) has become the centerpiece of my life over the past year. After officially opening in September, 2011, it continues to evolve, as does my understanding of the amazing resources that have always been available if we possess the knowledge to know where to look and the wisdom to act when it resonates with us. The PEC has given me a regular place to be on somewhat of a prescribed schedule. Some people would refer to this new practice as a “job” but for me, it’s more of a daily revelation. It’s not hard to be here. On the contrary, I have had to employ creative measures to stay here since, as a business, it is not yet self-supporting, financially speaking. While I received help to acquire some of the equipment and technologies that we have here – including the Photon Genius, Energy Enhancement System, and Trifinity8 technologies – the business itself was not funded and we have scuffled (and succeeded so far) to maintain harmonious relationships with landlord, contractors, and investors, amid financial stresses that have impacted just about everyone. Yet, it’s a fitting testament that the time is now right for this beginning. The stresses that you don’t buckle under or run away from will reveal your resolve and strength. In that respect, we are resolute, and very strong. As old energies have stepped away, new individuals are feeling a call from a place within themselves, to come to Arizona and give their energies to helping the PEC — and the ideas and methods that we are embracing — to grow. Being at the Center gives me an opportunity to lay some of the crazy ideas that you’ve become accustomed to in this forum on the unsuspecting public. We speak, not from a place of having been told what is “true” and what is not, but from learning and experiencing truth for ourselves, in our own lives. I learn, experience, and share, with a respect for where others are, or are not, in their own healing journey, which is a journey of awakening consciousness. how well said health care system has sold the idea of “diseases” as entities unto themselves to be fought, and defined its success by symptom abatement rather than the restoration of health. I continue my studies of the consciousness-based methods of Grabovoi and Petrov, having now received Svetlana Smirnova’s two books, Introduction to the Methods of Grigori Grabovoi and Methods of Healing Through the Application of Consciousness, based on Grigori Grabovoi’s teachings, while Book III, Save the World Around You, by Arcady Petrov from his trilogy, “Creation of the Universe,” has shipped and is in transit. I was keen to go to Thailand to attend a Grabovoi concept workshop there. However, a reader who heard feedback from a number people who had made the journey emailed me to suggest that it might be wise to contact Carol Roberts, an Australian-based teacher of Genome Healing, who had attended workshops in both Thailand and with Petrov himself in Moscow, and, for various reasons, came back somewhat less than thrilled about the experience. After several extended conversations with Carol, particularly with our common desire for clear communications, I feel that far more value and understanding could be gleaned from her workshop than the others. So I intend to take her course in April, and bring her and her team to Arizona for a 7-day course – June 11-18. Class size will be limited to 24 people, and the tuition is $3,000. We are working out the details with respect to the venue, and we will support it with a series of interviews with Carol via Skype, and possibly an interactive one from Australia. I’ll have more on that, along with a web site, very soon. I can’t say that I have personally changed that much since I began reading the Grabovoi/Petrov material, but my understanding of the scope of change that we are capable of achieving – personally and collectively – has deepened significantly. It was very nicely complemented by the works of another Russian author, the Ringing Cedars (Anastasia) series of books by Vladimir Megré, that I read — all 9 of them — in 2010. Books by David Wilcock (The Source Field Investigations), Duncan Laurie (The Secret Art: A Brief History of Radionic Technology for the Creative Individual), Langston Day (New Worlds Beyond the Atom), and Edward W. Russell (Report on Radionics: The Science Which Can Cure where Orthodox Medicine Fails), have been my serial companions. It is as though I’ve entered a new world, a process that has been ongoing since I started my radio show “Talk For Food” (an audio, and now video extension of this blog), and invited Jim Humble to be a guest to discuss this product he had named, “MMS” on my 5th show. What I couldn’t imagine at the time was how close the effort would allow me to get, not just to the people who had brought forth such insights, but to the intrinsic truths – the underlying principles – that their insights were based on. While it would be correct to say that I became a “proponent” of MMS, I didn’t make the promotion of MMS my mission in life. I have never suggested that it cures every ill. It is certainly not the only “cure,” nor even the best one. But it remains a far better chemical tool than those that the medical profession currently administers to the public. The evidence that it has been involved in remediation of a very wide spectrum of conditions says more to what MMS helps to facilitate, than to what “it” cures. Though we do not administer, use, or promote its use at the Photonic Energy Center, I still support the use of MMS. If someone asks me about it, which happens fairly often, I answer their questions and/or point them in a direction. However, the focus and intent of the PEC is to call attention to an element that Jim Humble and many others have tended to dismiss in their zeal to encourage the adoption of their idea; that is, its energy and effect on the individual’s energy field, the importance of restoring its balance and coherence, and most importantly, the consciousness of the individual who is seeking remediation. In other words, you are the star in the drama that is your life. Your state of mind and sense of self is what gets overlooked when product or process-related problems or “cures” are focused upon. If we think that a product, drug or otherwise, can “cure” us, we absolve ourselves from looking in the mirror to see how what we’re experiencing right now, came to be. We gain no clue as to what to change or how. At the Photonic Energy Center we make it clear that we are not medical people, and we do not “treat” anyone with anything but coherent, beneficent, harmonizing energy or information. Some people would use the terms “consciousness” and “Soul” synonymously. The distinction isn’t really important here. Jim has been inclined to suggest that the body does the healing when MMS destroys pathogens, which are labeled “the bad guys” within in the body, and sees the product’s use as a weapon in just another brand of “war” that the individual must wage. He has been disinclined to acknowledge energy as a factor of any great import, even though the body itself is nothing but energy. Everything is energy, even MMS. However, energy that we cannot see and measure, except perhaps by effect, has routinely been discounted and dismissed. It is very easy to disempower energy that may have been present simply by maintaining a negative attitude about it. If we don’t believe in the methods that we have chosen, or in our innate ability to overcome the problem that we’re experiencing, then the method we’ve chosen is of little significance. There has been some controversy within the MMS community when Jim called out and, you might say, ex-communicated Ann Schneider-Cullen, an MMS supporter from the UK (who was also targeted by British authorities in aftermath of the Project Greenlife/MMS smear campaign), who had begun to market a tablet (sugar pill) infused with the energy of certain doses of activated MMS. Schneider-Cullen contracted a homeopathic pharmacist at Ainsworth’s, which are commonplace in London, to prepare a collection of mother tinctures that correspond to various doses of the conventional material, and sent some samples to me. She also had samples prepared by another method, known as Vibrionics. In both cases, the energy of the chlorine dioxide, which is produced as a byproduct of activating the MMS, was captured and transferred to a tablet. 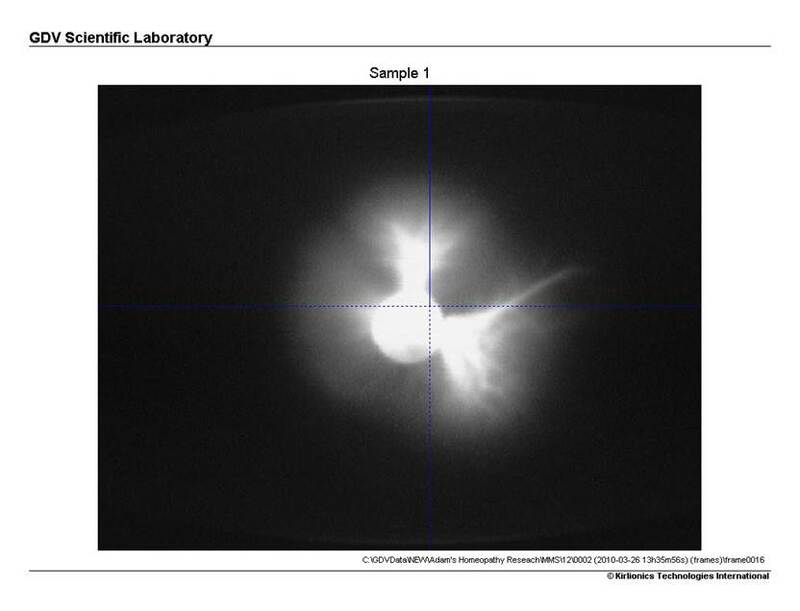 In early 2010, Schneider-Cullen sent product samples to me, which I took to Santa Fe, NM to be analyzed by Dr. Samuel Berne with a GDV, electrophotonic imaging system. The technology can read the energy emanations of humans, environments, or materials, such as water, and yes, MMS. The beauty of the GDV is not limited to the images that it is capable of producing, stunning as they are. 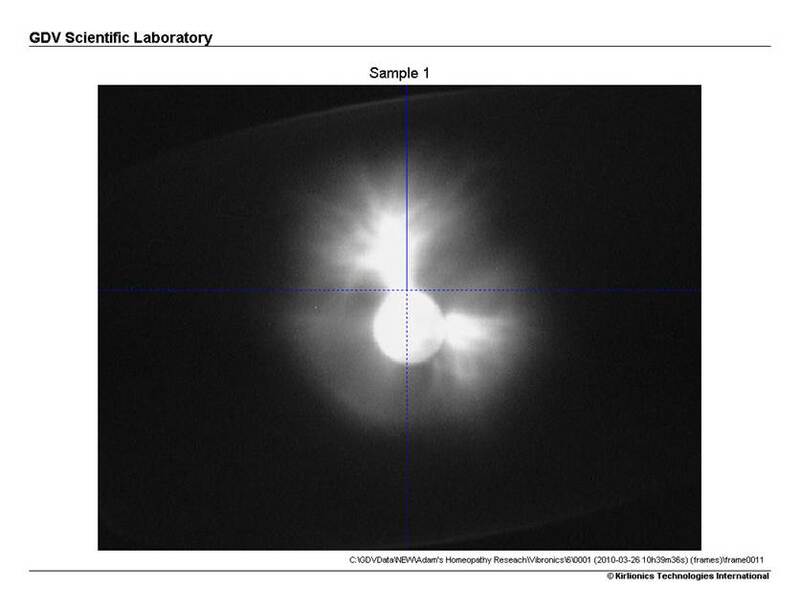 GDV image of the energy of a 6-drop dose of chlorine dioxide (activated MMS). The beauty is in the understanding that can gleaned from the images, which can be captured dynamically. The energy of the Vibrionic MMS derivative. As you might imagine, I was very excited to see this. Not only were the images remarkably similar in appearance, but the analytic data indicated that the quality of the energy was low in entropy. In other words, the energy of the MMS, and the Vibrionic derivative, were both of a type that, if you knew nothing more about them other than this quality, would indicate a beneficial effect. These images, confirmed and supported by GDV analysis, tended to explain why (1) MMS has been so helpful for to so many, and (2) why a vibrational derivative might also work. With this information in hand, in April, 2010, Schneider-Cullen and I both attended the first MMS workshop in Barahona, Dominican Republic. Desiring to offer the public another viable way to enjoy the benefits of what MMS can do, there was also a natural desire for Jim to bestow his blessings on the effort, essentially endorsing it. Jim Humble at the whiteboard at first MMS workshop. Jim’s research hadn’t been in the area of “energy;” it was in chemistry, which he understood very well. He did not understand how what amounts to a non-atomic vibrational signature could substitute for a molecular particle. Or how the “energy” of the chlorine dioxide could be separated from the chlorine dioxide itself and applied to a sugar pill. I trusted that it was possible, which was corroborated by the images and data that you see above, as well as roughly 200 years of history that predates the discovery of chlorine dioxide, starting with Samuel Hahnemann (1755 – 1843), the father of homeopathy. However, this wasn’t the place for a debate. Jim’s investment in time and energy to bring MMS to the public’s attention earned him the right to decide what he wanted to endorse and what not to. Furthermore, there were enough variables to deal with regarding MMS. They included trumped up claims of a death attributable to MMS ingestion in the South Pacific by the widow of a woman by a husband who exercised (apparently successfully), far too much influence on the thinking of the investigating authorities of Vanuatu, to be above suspicion himself. Jim had other, more important things on his mind, i.e., the genesis of his church, which he called, Genesis II. He did, however, agree to support some experimentation. Allow people to take the vibrational MMS, document it, and see what happens. Ann had done some of that already. Later that year (2010), after recording a talk that Jim gave in Amsterdam at the Nexus Conference, and a workshop in Germany, near Dusseldorf, I traveled to London and interviewed several people who had experienced the MMS tablets, as well as David Needleman, the pharmacist that prepared the homeopathic remedy. At the first workshop in Barahona, which was also attended by members of Project Greenlife, which by that time was the largest MMS distributor, and who would have naturally offered the tablets too, it was agreed that they would conduct the energy tablet experiment. Several months later, in August of 2010, the lives of the Project Greenlife staff was to take a different turn, as the FDA officially declared war on MMS, seeking to set the public straight about the solution by publishing misleading information and going after what it deemed to be a kingpin in the nascent MMS industry. The outcome of this smear campaign, which spread to Japan and the UK, is still unfolding. Today, in early 2012, Ann Schneider-Cullen, who changed her surname to Gylman, has fallen out of grace with Jim Humble. The changes in name and relations do not appear to be related. The MMS workshops continue. Furthermore, Chlorine Dioxide Solution, or CDS, is in its ascendancy. In several newsletters that he publishes frequently to his mailing list, Jim firmly denounced Gylman for not acting in a timely manner to stop billing the energy pills as MMS, failure to make it clear that they were experimental, and wrote that he’d seen no evidence that they work. Ann Gylman now sells Love Frequency (528) pills. Still hasn’t changed the footers on her emails saying that she’s the official MMS distributor in the UK. Her site (www.mmsonline.info) still touts the MMS pills. Nothing nefarious by either party, and yet, there’s not much love between them right now, because the energy has changed. I hadn’t planned on writing about this, but now is as good a time as any. There are some details here and there that I’ve probably left out, but this is the gist of what happened. And the gist of my assessment of it all is that it’s all perfect, everything that happened, as it is. We often get side tracked when we think that the way things are now is the way they will always be. Rarely is this true… unless love is actively involved. The experiments with MMS and Vibrionics energies was a valuable learning process, making it possible to have an independent and impartial “third party” to help us to see and make our way into a new and heretofore unfamiliar world. The GDV can go a long way toward helping us gain a better appreciation, trust, and confidence in “energy” products. We intend to acquire a GDV and use it at the PEC. The GDV would allow one not only to capture energetic emanations, but allowed the scientific analysis of the quality of the energy, or I should say, energy field so captured. This is more than a kirlian image. It produces not just a static, but a dynamic reading. The analytical capabilities of the GDV, which was developed by Dr. Konstantin Korotkov, allows the amount of entropy, to the positive or negative, to be known. Positive entropy is unhealthy, much in the way that positive ions are. They are destabilizing, explosive. Negative entropy, as is the case with negative ions, are implosive, organizing and harmonizing in nature. This is Restoration of the Norm of the Creator territory. On the other hand, we tend to dismiss the curative potential of a positive attitude (or belief) about an idea. This is the same mindset that has dominated allopathic medicine with the rise of pharmacological products, strategies and orthodoxy. Medicine is bullish on pharmaceuticals and negative about anything that their “authorities” haven’t sanctioned. In actuality, MMS is a superior use of pharmacology… far superior than the vast bulk of pharmaceuticals that licensed medical practitioners are legally killing people with at this very moment. However, it is the consciousness that is actually doing the killing. The “deadly pharmaceuticals” are facilitators. Pathogens are the result of ecological imbalances that result from the non-natural materials and disruptive energies that dominate our “modern” lives. The consciousness that is killing patients is shared both by the patient and the medical practitioner, as well as the system that said medical practitioner operates under. None of this is engraved in stone. The agents of change are one’s choices and actions, fueled by a shift in beliefs. The FDA has been basing its sense of authority on pharmacological medical $cience for so long that it has failed to see how ludicrous its claims of jurisdiction are. “All ‘cures’ are ‘drugs. '” The greater problem is that neither academia, nor conventional scientists in colleges or universities, are pointing out the now obvious cracks in their thinking. Attorneys are mum, and will not challenge the agency, but they will be quick to sue when the damage has become undeniable. The medical system’s focus has shifted away from maintenance and restoration of health, to a fear of, and anticipation of disease (even when one is healthy), and the management of symptoms. Orthodox medicine has made fear-based, pharmaceutical prescribed, metabolism disrupting and immune suppressing methods their Standard of Care, taking precedence over the maintenance and restoration of balance, otherwise known as homeostasis. And we’re continuing to allow it. Few people ask where the pathogen, or the cyst or tumor comes from. How, why, or under what conditions does it evolve? These are the questions that can only be answered by and through conscious acts of consciousness. This is where true healing becomes possible, as individuals reconnect with (1) love, and (2) their purpose for being here, meaning experiencing Earth through a physical form. Where we think, and have been conditioned to continue thinking, that life “happens” to us, it has become evident that life happens through us. In spite of the brevity and succinct angularity of his translated speech from Russian to English, Grigori Grabovoi makes the point that we are not experiential bystanders in the healing process, but active, conscious participants. Even in passivity, our mere presence in what David Wilcock refers to as Space/Time, makes us active parties in how life on Earth and throughout the Cosmos, unfolds. What we don’t appreciate is the role that Time/Space, the realm of energies that, for almost 100 years, have been tapped into and directed by Radionics pioneers, can play in the transformation of our health and world that awaits. While people say they’re waiting for peace, others continue to pick up guns against others who fear annihilation, sometimes pulling the trigger, and the circle continues. However, there are no mistakes. Both the “villain” and the “victim” are “joined” energetically, magnetically. The victim who sets aside his fears and loves life is more powerful than the biggest, most “lethal” gun. We are also joined with their drama, because their interactions reflect a “conflict” or energetic disturbance, that we have allowed to fester within ourselves. Harmonizing the world within one’s self will change the energy of one’s inner world, including a change in the microbial order that exists therein, and then be reflected in one’s outer world. The most “inner” of one’s inner world, is the energy field. It is one that is subtler, meaning generally not detectable by current-day technology, but this realm of the progressively small is actually denser than the world we can measure. It fills the space between the nucleus of an atom and its spinning electrons. There are many more fundamental forms of energy, some of which are in our range of perception and most are beyond. Such energy spectra that are outside of our range of perception can be called on and used, both to our benefit and detriment. We hear almost exclusively about energies that are harmful or detrimental, so such “bad news” is easy to believe, and even think that it is very likely to affect us. Since we don’t spend nearly as much time learning about beneficial energies, it’s easy to dismiss “good news” as not likely to affect us. The term “spontaneous remission,” is one way to describe, but not explore, a situation where a new and harmonious alignment of energies has been achieved. We’re left with the idea that it was a “placebo,” “luck,” or “Providence,” but we dismiss the conscious act of consciousness that a human being chose in order to make it happen. I am pleased to be learning that we – human beings – have such wonderful powers available to us, all for the price of opening up our minds and hearts to understand more fully Who and What we are. I am also astonished to see how simple and difficult the awakening process can be, because each human already has the power to change his or her world in magical ways. The “miracle” is not the MMS, or the structured water, or Photon Genius or Energy Enhancement System, or any other new and great technology that comes along. The miracle is within, with a simple change of one’s mind to resonate with the loving heart. There will always appear to be a good reason to justify maintaining a hard heart or closed mind. However, we pay a dear price in never gaining the opportunity to know and experience the immeasurable blessing that forgiveness, joy, love and friendship can bring. Consciousness is expanded only by and through loving choice and action, by harmonization, restoration of balance, not by force, but with the power that enhances THE WHOLE. Consciousness can be expanded unilaterally. In other words, it doesn’t take agreement by anyone else for an individual to expand his or her consciousness. It is not expanded by “seeking expansion,” but by being expanded within the field that is Love. The sense of oneness with all, including the Creator of All, is a glimpse of the true nature of our being, for it connects us consciously with the Creator, AND with All of Creation, meaning, with each other – “friend” and “enemy” alike. I am grateful to see what I see now, and to all who have helped me to get to this wonderful and joyous place. It would be easy to say that we have much work to do to change the world, but actually and simply, it would be better to see that we have much more joy, equanimity, peace, love, and tranquility to be. Jim Humble call the MMS a church sacrament , and this would be implying that MMS is also with some spiritual or church energy. I m surprised, that he did not endorsed the MMS energy pills. All the churches today, and in ancient times eastern and western religions are about spiritual energy, healing for mind, body, and soul. The Chinese herbal medicines, and acupuncture thousands of years old energy healing. Actually, JH does not claim any spiritual, religious, or church energy. In fact, he has gone so far as to deny any spiritual, religious involvement for the Genesis2 Church. This is a protective mechanism for those who might use MMS or suggest it to friends as a healing adjunct. His training and background does include some energetic work, but even that (the tapping work) might be considered “physical” – If Ann’s pills had “worked” and he had proof of it, I’m sure he would have been much more open to it. But his experience was that it didn’t. He asked her to desist. She could have then renamed the pills and continued to use them in her own work – she chose not to. Energy signatures are grand, but I would want actual proof in my 3D body that they were working. That’s just me. But it is also the reason I like the Grabovoi-Petrov stuff so much. Documented proof. I originally looked into healing modalities because I felt there may well come a time when “traditional” methods are no longer available to us. I wanted something in my back pocket for family and friends. I got my 1st and 2nd degree reiki – There were times it worked, times it didn’t – I’ve done homeopathics – there have been times it has worked, and times it has not. But all along I knew that I wanted to have both a energetic method and a “physical” method. Because a lot of the people I might be able to help are not open to energetic therapies. That does not come in their worldview. MMS is excellent for those people, I use it myself. The situation between Jim Humble and Ann Gylman apparently has more to it than we all know. I think that if JH had not gotten emails from users with issues about the sugar pills, the outcome might have been different – but he basically puts the end user first. Is he perfect? No. But he was open to trying. Gotta give him that. The Grabovoi/Petrov work interests me greatly, I think it will be energetically an excellent balance to the MMS on the physical. I’m eagerly awaiting the video, Adam .